Personalized Blues Brother Style Kid's Sunglasses are wonderful customized product which can be distributed in kids’ parties and promotional events targeting kids. Make them happy by presenting them their favorite Blues Brother Style Kid's Sunglasses. The UV400 protection of these custom sunglasses makes it a cool product to use whenever kids are stepping out of home in sunny days. Get your logo imprinted on the 1 1/2" x 1/4" imprint space in these custom kids’ sunglasses and make your brand popular. Kids’ stores and fashion brands can make use of this opportunity. Order now and enjoy free artwork design and free online proofs facilities. 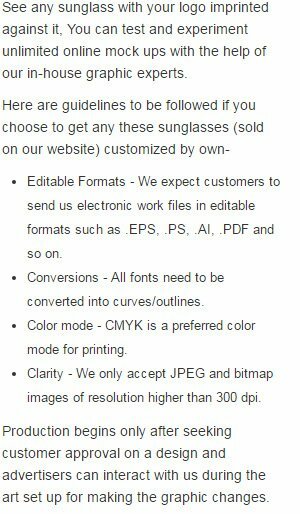 Request a quote to know price cuts that you can avail for wholesale Personalized Blues Brother Style Kid's Sunglasses.